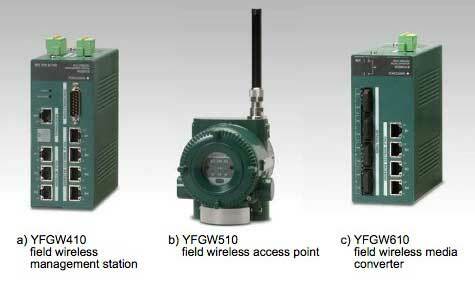 Yokogawa has developed a large-scale, highly reliable, next-generation, plant-wide field wireless system that conforms to the ISA100.11a wireless communication standard for industrial automation. By separating the access point function from the system manager and gateway functions, this system has achieved a more flexible system configuration. It can manage up to 500 field wireless devices and achieves the world's first full system- wide redundancy as well as high reliability. This paper introduces the products and their technologies. Development & Engineering Dept., Yokogawa China Co., Ltd.
To respond to such expectations, Yokogawa has released the world's first field wireless devices that conform to the ISA100.11a standard1 and has accumulated business results by supplying these devices to a wide range of fields everywhere around the world. Through these results and experiences, Yokogawa has understood that, rather than installing field wireless devices separately on a case-by- case basis, large scale plant wide field wireless systems are preferable in order to improve plant production efficiency . Reliability: Ensures high reliability applicable to control usage by integrating advanced wireless technologies and redundancy technologies. Such reliability as being less susceptible to interference from numerous wireless signals is required in large scale field wireless systems. Flexibility: Provides a flexible architecture with which devices can be freely installed or added at various locations in a large scale plant. Openness: Conforms to the open ISA100.11a standard, which allows the interoperability with field wireless devices in a wide range of areas, including third party ones. This paper outlines a new field wireless system configuration proposed by Yokogawa, the new products composing it, and their technical features. Figure 1 shows an example of a large scale field wireless system configuration with full redundancy covering from a host system to its field wireless network. A set of two YFGW410 field wireless management stations connected to each other via a synchronization cable provides redundant wireless network management and gateway functions for the host system and the YFGW510 field wireless access points. In each wireless subnet, the installation of multiple YFGW510s achieves the redundant field wireless network for field wireless devices. A pair of YFGW410s can handle up to 20 subnets and up to 500 field wireless devices. 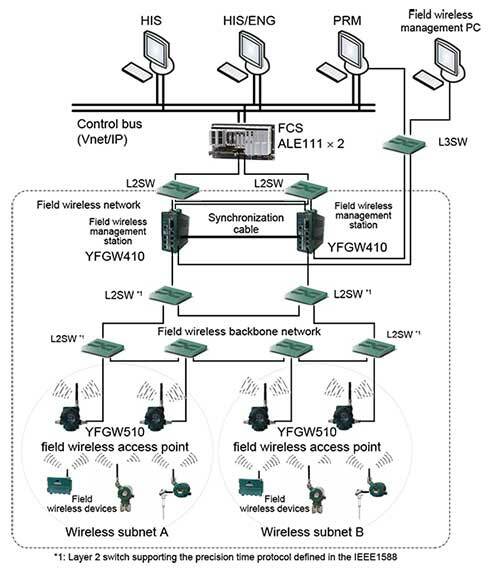 In an environment where the YFGW410 is already operating, the additional connection of the YFGW510 to the field wireless backbone network makes it possible to add a wireless subnet without suspending the field wireless system. This allows for the sequential expansion of the system responding to changes in the site being monitored or controlled. Figure 2 shows the external views of the new field wireless system devices developed as components of a field wireless system. For external communication, the YFGW410 is equipped with eight 100BASE-TX ports, one RS485 port and one RS232C port. Three of the 100BASE-TX ports are for the upper level (for a host system), four for the lower level (for field wireless backbone), and one for maintenance. The communication ports for other systems have built in surge protection circuits, and this allows the YFGW410 to be installed in various network environments without any additional network devices or surge protection devices. To manage up to 500 field wireless devices and support multiple external communication ports, the YFGW410 uses a microprocessor which has a much higher computation performance than that used in existing field wireless system devices has, and a device to implement a multiport layer-2 switch function into it. The problems with power consumption and heat generation peculiar to these high performance devices have been resolved by adopting the optimum board and power supply designs, by developing a unique heat sink with superior cooling capability, and by carefully selecting components. All of these measures have made it possible to ensure a wide operating temperature range of between - 40°C and 65°C. 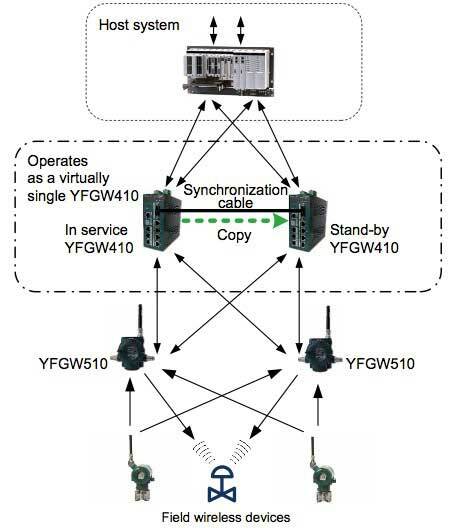 By simply connecting two YFGW410s to each other via a dedicated synchronization cable, both will automatically recognize the redundancy structure and perform the configuration. This prevents incorrect wiring and settings during installation work and replacement for repair. The signal line for data synchronization is duplicated. Even if one line is disconnected, the field wireless system can continue the operation without suspension. The YFGW510 incorporates wireless chips and RF front end circuits conforming to the ISA100.11a standard and a low power consumption, high performance 32 bit single chip microprocessor in one piece of substrate, which is put into a newly designed compact flameproof enclosure. This enables a single YFGW510 to cover up to 100 field wireless devices and to be installed in Zone-1 hazardous areas2. The YFGW510 can mount components depending on the backbone communication interface. This offers the option of the IEEE802.11a/b/g (wireless LAN), in addition to the 100BASE-TX and 100BASE-FX. This wireless LAN interface facilitates the installation of the YFGW510 even inenvironments where wiring with the YFGW410 is difficult. The YFGW510 is also intended to implement communications via existing instrumentation cables. The YFGW510 can incorporate two compact high performance, low power consumption modules for a wireless LAN, which enables redundant communication by the observation of the communication quality and automatic switchover, and attains a highly reliable wireless LAN backbone. The YFGW610 converts the connection interface of the backbone communication between the YFGW410 and YFGW510. The YFGW610, a four port media converter, is installed between the YFGW410 and the YFGW510, and converts the lower level metal network interface connection (for 100BASE-TX) of the YFGW410 to the optical network interface connection (for 100BASE-FX) to connect with the remote YFGW510. This features a low latency of 50 m s enabling high precision time synchronization as well as a wide temperature operating range from - 40°C to 65°C. Figure 3 shows the redundant system configuration and operation of the YFGW410. The YFGW410 employs a stand-by redundant system, whereby if the in-service YFGW410 fails, the stand-by YFGW410 takes over and continues the ongoing process. In the redundant operation, two YFGW410s operate virtually as a single YFGW410. The host system communicates with both by using a single virtual IP address assigned to them. Therefore, even if a switchover occurs, the host system can continue the process regardless of which hardware is in-service. Likewise, accepting requests through the single virtual IP address, the in-service YFGW410s perform such processes as connecting field wireless devices and downloading their settings. When parameters kept in the in-service YFGW410 are changed, they are instantly copied to the stand-by YFGW410 via the synchronization cable. Thus the switchover completes within one second after failure detection, even in a large system. The faulty YFGW410 can be replaced with a new one without any special settings to it while keeping the system running. The new YFGW410 automatically obtains the configuration information from the in-service one upon the startup, and starts the stand-by operation. Conventional autorouting is effective for places where a direct line of sight is ensured or for conditions with the frequent relocation of field wireless devices. However, its time to the completion is relatively long because of its autonomous route finding. If the route cannot be found, it is difficult to decide how to change the installation conditions of devices for successful finding. In addition to the autorouting, a fixed route setting is available in this system, by which users can individually specify their desired routes. The fixed route setting reduces the amount of work at sites because the result of the setting is immediately verified. Furthermore, this setting ensures a reliable and stable route redundancy by avoiding such a path as where movable obstacles such as vehicles move across, causing communication problems. By using the Duocast communication technology, field wireless devices simultaneously transmit their sensor data to both the primary and secondary YFGW510s, and the YFGW510s transmit received data to the duplicated YFGW410s. Figure 4 shows the comparison between the Duocast and the conventional technology Unicast. If the communication between the primary YFGW510 and field wireless devices fails, the YFGW410 transmits the sensor data received via the secondary YFGW510 to the host system. Because Duocast provides redundant communication paths without any data retransmissions, sensor data is not lost and communication latency does not increase even if the communication through one route fails. Compared with Unicast, which deals with a communication failure by retransmissions, Duocast achieves the same reliability with one half of the communication time. For data transmitted to field wireless devices such as output values and control parameters, the redundant communication routes are established by consecutive and alternate transmission using Unicast from the primary and secondary YFGW510s to field wireless devices. The field wireless backbone network, which connects the YFGW410 and the YFGW510, has the following features to achieve a highly reliable, large scale, distributed field wireless system which conforms to the ISA100.11a standard. In the field wireless network based on the ISA100.11a standard, the time division multiplexed communication is performed, where all of the connected devices synchronously communicate within a precision of one msec. This allows stable communication with no data loss caused by wireless signal collision and no latency increased by retransmission even if many field wireless devices are located within a radio wave propagation distance from each other. The precision time protocol defined in the IEEE1588 is used for synchronization over the backbone network. This enables commercially available products with a correction function for communication latency to be used as LAN switches required for configuring a large scale network. In addition, the YFGW410 and YFGW510 are equipped with hardware for the IEEE1558-based time synchronization packet, which enables precision synchronization not affected by the load of software processing. The master clock for time synchronization over the whole system is kept in the YFGW410. In the redundant operation of the YFGW410s, the master clock is also redundant. The in-service YFGW410 periodically sends a time synchronization packet to the backbone network and the stand-by YFGW410. Even if the in-service YFGW410 fails, the stand-by YFGW 410 can maintain time synchronization with the YFGW510 by starting a master clock operation using its time as a new master time, because the time of the stand-by YFGW410 is synchronized with the in service one. At the startup, the YFGW410 automatically distributes initialization parameters such as an IP address assigned to the YFGW510, which facilitates the installation and replacement of YFGW510s. The protocol stacks of the YFGW410, which need to handle communications from up to 500 field wireless devices, are carefully implemented to shorten their processing time. The communication buffer for packets processed by the wireless network management function, and that for packets processed by the gateway function, are managed separately. Each communication buffer is processed in parallel with different priorities. This ensures that the authentication processing for field wireless devices to be newly connected to the network and the transfer processing for regular sensor data communication do not affect each other. 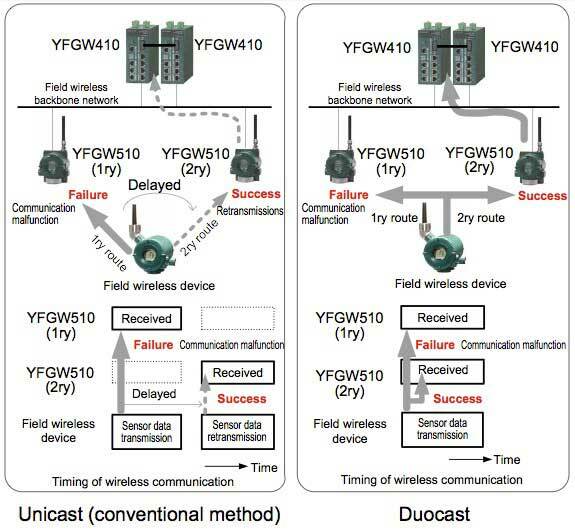 Simultaneous transmission of data from field wireless devices to both of the in-service and stand-by YFGW410s by Duocast using multicast IP packets achieves quick switchover within one second without data loss when the stand-by YFGW410 switches to in-service mode. The new field wireless system configured using the YFGW 410/510/610 as main components enables the field wireless to shift from one for simple monitoring applications to one for control applications. Yokogawa will make it easier to configure the backbone network using existing instrumentation cables, and also will make efforts for achieving the fusion of wireless technologies combining wireless LAN applications and field digital solutions integrating wired and wireless technologies. IEC 60079-10-1 ed1.0 (2008-12), "Explosive atmospheres - Part 10-1: Classification of areas - Explosive gas atmospheres"; IEC 60079-10-2 ed1.0 (2009-04), "Explosive atmospheres - Part 10-2: Classification of areas - Combustible dust atmospheres"
Field Wireless Media Converter YFGW610 is used for signal conversion between Field Wireless Management Station YFGW410 and Field Wireless Access Point YFGW510/YFGW520.